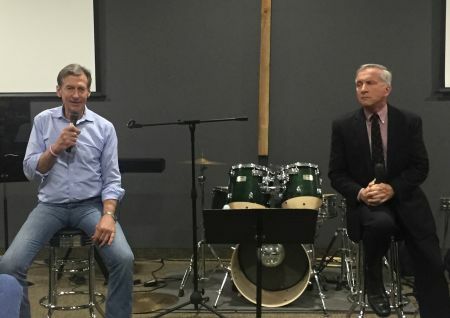 REDMOND, OR -- Two Republican candidates for Governor faced off Monday night at a town hall-style forum hosted by the Redmond Patriots, just over a month away from the May Primary. Central Oregon businessman Sam Carpenter says one of Oregon's biggest problems is that no one is held responsible for using taxpayer dollars wisely. "What are the two most spendy sections of our economy? You have to ask yourself that before we can answer this question. One is Healthcare, and One is education. What is the commonality here? The government runs it." He told the crowd he believes the best way to reform the government is to vote. "In America, every two years we get to go to the ballot box and change things; it's a revolution opportunity every two years! This is what Trump was all about, isn't it?" Retired US Navy Captain Greg Wooldridge agrees tax money is being wasted, "$10 million here, $20 million there, $40 million here, $100 million there, and pretty soon, it adds up to real money. Our money!" When asked about welfare reform, Wooldridge said, just like a lot of problems in the state, change is impossible if everyone isn't working toward the same goal, "The one place to start is like Dennis Richardson is doing with all the agencies: scrub 'em! Scrub 'em out! he's doing a great job; make those findings public knowledge," He told the group, "Dennis Richardson - I can't wait to make him my wingman. We're gonna tear it up." Capt. Wooldridge says people are clamoring for "affordable housing," but he doesn't want to create housing that defines people by their level of income, "I don't want to call it affordable housing, I want to call it making housing affordable. Right? And that's the difference. We change the land use laws, we make more land available to build upon, so people can build homes and make them more affordable." The two also talked about PERS reform, Oregon's "sanctuary state" status, school funding and forest health. When asked about the state's legal marijuana industry, Carpenter surprised the crowd when he said, "Okay. I was at Woodstock, and yes, I inhaled. That was 50 years ago." He went on to say, "I don't like it, but as the Governor, it's the law, and that's what we have to deal with." Wooldridge said he appreciates when small communities stand up and just say no to marijuana, "We're suffering because of Oregon's pot laws. And people, employers who want to come here - think of defense contractors - that's an issue with them. So, no, we shouldn't have done it, but it is the law." Bend State Representative Knute Buehler, seen by many as the Republican front-runner in the race for Governor, did not attend Monday's forum.